32 oz. – Bottle renews 625 square feet. Made in the USA. One application of this industrial-strength, petrochemical-free formula fills in scratches and rejuvenates dull spots on sealed wood, vinyl, linoleum, terrazzo, concrete, marble and slate floors. 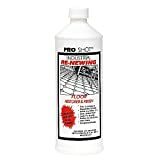 Floor Renew goes on just like a wax and dries to a brilliant finish that lasts for months. Protects floors from stains, heel marks and yellowing without buildup. 32 oz. – Bottle renews 625 square feet. Made in the USA.